The dispute centres on a row over trade union membership. HUNDREDS OF AMBULANCE staff are set to go on strike on three days over the coming weeks. Members of the National Ambulance Service Representative Association (Nasra) plan to go on strike from 7am to 5pm on Friday, 15 February; Thursday, 28 February; and Friday, 1 March. Workers already staged a 10-hour work stoppage at the end of January. Nasra is a branch of the Psychiatric Nurses Association (PNA). The dispute centres on the deduction of union subscription fees from members’ pay and a demand that the HSE recognises their union. The dispute is separate from the industrial action over pay and staffing levels being undertaken by thousands of psychiatric nurses who are also PNA members. Sinead McGrath, National Chair of Nasra, called on Health Minister Simon Harris to avoid further escalation in the dispute and “instruct the HSE to engage with the industrial relations machinery to end this dispute”. 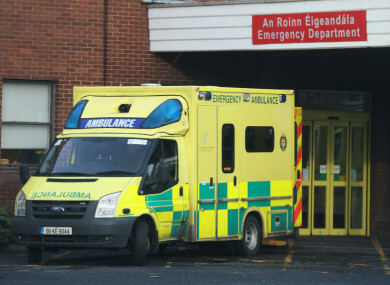 Members of the Irish Nurses and Midwives Organisation are also engaged in an ongoing industrial dispute, citing similar concerns to psychiatric nurses. TheJournal.ie has contacted the HSE for comment. Email “Ambulance staff announce three more days of strike action ”. Feedback on “Ambulance staff announce three more days of strike action ”.